This is a guest post by Michelle Davis, an artist, graphic designer and medical illustrator. The muscles that control the hands and wrist can be broken down most easily into extensors and flexors, and of course, these groups can be further broken down. Ironically, relatively few of these muscles insert and originate in the hand (what I’ll call intrinsic hand muscles) — the rest are purely tendons by the time they get travel through the wrist. Before digging in, we need to do a quick primer on some medical terminology that helps in understanding names and locations of muscles. All these terms are relative, and similar to anything you’re familiar with in weightlifting. And they’re all pretty self explanatory. The insertion end is attached to a bone which a muscle will move when it is contracted. The origin end is attached to the bone which does not move. The flexors originate on the anterior forearm, on the medial side of the elbow joint. In other words, when you hold your arm palm up, these muscles are coming from the inside of the elbow. These insert on or close to the wrist, and flex the hand and move it side to side. Insertion on middle phalanges. This one flexes the fingers. These reach to the finger (and thumb) tips. Pronator quadratus — this one turns the wrist over. The extensors compliment the flexors — they originate on the posterior side of the forearm and/or the lateral sides of the radial and ulna. Hold your hand palm down and its the little bit of meat facing toward the ceiling. Extensor carpi ulnaris — extends the hand, and attaches to the pinky finger metacarpal. Extensor pollicis brevis — extends the thumb, and inserts on distal thumb phalanx. Finally, there are the intrinsic hand muscles. Just to make things confusing, most of them have the same words in them as other hand muscles, just in different orders. On the up side, if you think about what those words mean, you’ll immediately know how that muscle acts. Thumb (“thenar”) muscles: start from the palmar side of the wrist and insert on parts of the thumb. “Pollicis” also means thumb. 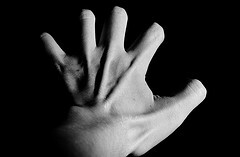 Pinky finger (“hypothenar”) muscles: start from the pinky finger side of wrist and insert on 5th metacarpal or finger. Central compartment muscles: these ones run in the depths of your palm. Adductor pollicis — brings thumb in toward palm. Lumbricals (4) — supports flexion of the hand and extension of the fingers. Interossei (4 dorsal, 3 palmar) — lets you spread and close your fingers. They’re between your metacarpals and insert onto on the fingers. So! The control of our hands is a complex process, and I didn’t even delve into nerves, vascular supply, or joints. If my count is right I just listed 36 muscles controlling the hand and wrist movement – and, as a guitarist, you know there’s some impressively fine control available. There definitely aren’t that many muscles controlling thigh movement. This was a great synopsis of the anatomy of the hand. Thanks for posting. It will be very useful to musicians.